I watched the film adaptation of Edith Wharton’s ‘The Age of Innocence’ directed by Martin Scorsese a few days back. I love Martin Scorsese’s movies. He is more well known for his gangsterish movies and others closer in theme to them. This is a very different Scorsese movie though because he has adapted a classic, a very unique film in his repertoire. The basic story is this. The time is 1870s New York. Newland Archer is a young lawyer who is engaged to May Welland. Both of them are happy. And then a third person walks into the scene. It is May’s cousin Ellen. Ellen is married to a count in Europe and so she is Countess Olenska. Ellen has been away for a long time and she is European in thought and manner now. She is independent and liberal and creates a few flutters. She is back because she wants to divorce her husband, the count. Newland ends up handling her case. And before both of them realize, something happens and sparks are flying. What happens between Newland and Ellen? Will Newland’s love for May survive this? Will they get married? Can there be a happy ending to a triangle-love-story? Well, you have to watch the movie to find out. I haven’t read Edith Wharton’s original novel, though it has been on my ‘To-be-read’ list for ages, and so it is difficult for me to compare, but looking at it independently, I loved this film adaptation. The New York of the 1870s comes alive on the screen, the workings of the high society of New York, the way social power and hierarchy is structured, the said and unsaid social and cultural rules – these are all beautifully depicted. The film won an Oscar for Best Costume Design and we can see why. The casting is mostly perfect. Michelle Pfeiffer is beautiful and perfect and delivers a brilliant performance as Madame Olenska. I think this is my most favourite performance of hers yet and it definitely deserved an Oscar. I can’t believe that the Academy had never awarded an Oscar to Pfeiffer till now. Winona Ryder is wonderful as May Welland. Daniel Day-Lewis is good as Newland – for some reason I am not a big fan of him, though I love his voice. Scorsese’s direction is, of course, perfect. I have to talk about one more thing. The last scene in the movie. I won’t describe it, because you have to watch it yourself. It was so beautiful, brilliant, poignant and perfect, that I couldn’t stop crying. Then I put that last scene on repeat mode and watched it for an hour. It was a perfect ending to the story like the best endings. After watching it, I took down Wharton’s book from my shelf and read that last scene. It was beautiful, but I have to say this. Though I believe that a book is mostly better than its movie adaptation, I have to still say this. Scorsese takes that beautiful last scene from Wharton’s novel, and improves on it and makes it better. He makes it brilliant. It just shows what a great director he is. What a great master he is. Now the only thing left for me to do is to read Wharton’s book. I can’t wait to do that. Have you seen ‘The Age of Innocence’? I first heard about Cheryl Strayed’s memoir ‘Wild’ when I read Valorie’s (from Books Can Save Your Life) review of it. Since then I have wanted to read it. When I discovered that Reese Witherspoon has made a movie out of it, I decided to watch that first. ‘Wild’ follows the life of Cheryl Strayed when she decides to take a hike for more than a thousand miles on the Pacific Crest Trail. She has recently gone through a divorce and her mother, whom she loved dearly, has passed away after suffering from cancer. Cheryl feels that the hike will heal her heart and make her see things from a new perspective. She has no experience of hiking before and so she learns new things everyday – her stove doesn’t work initially and she has to throw it out, her shoes are too small and her toes start hurting and bleeding soon and her backpack, which she has carefully packed with all things which she considers necessary including a few books, is heavier than her (one of the characters while welcoming her to a resting place tells everyone there – ‘Say hello to Cheryl and the monster’, the ‘monster’ being her huge backpack.) She meets strangers on the way, most of whom are hikers or who work in farms or live in the countryside, and they are mostly friendly and help her out. One of them shows her a resting place and when she reaches there welcomes her and makes her comfortable and introduces her to other hikers there. Another cooks her a meal and shows her how to travel light. Another takes her home, when she is stuck in the middle of the wilderness without food, and Cheryl is able to have a hot shower and a hot meal. There are virtually no woman hikers, but Cheryl meets one accidentally and she is so happy with the encounter and they have a long conversation. Cheryl also meets a shady character or two, some of whom look threatening and dangerous. She also meets a snake, a fox, a llama, a dog and a horse. She traverses through different kinds of terrain – deserts, fields, mountains, snow-covered peaks, small streams and big rivers – she hikes through them all. During her hike, while resting in the night inside her tent she reads books, mostly Adrienne Rich’s poetry. At every rest place she leaves a quote from a poet or a writer with her name written alongside. Other hikers see that and Cheryl becomes famous among hiking groups. While the movie shows Cheryl’s hiking in a linear manner, it also goes back and depicts her life as a child with her mother and brother, her relationship with her mother after growing up, how her mother is always happy though the situation of the family isn’t that encouraging (Cheryl says this while talking to her fellow woman hiker – “My mother used to say something that drove me nuts. There is a sunrise and a sunset everyday. And you can choose to be there for it. You can put yourself in the way of beauty.” It was one of the most inspiring scenes in the movie and one of my favourites. I live near the beach, but I am ashamed to say that I rarely go there these days. After seeing that scene, I feel I am wasting all that beauty. I should put myself in the way of beauty – in the middle of that sunset – one of these days), how her relationship with her husband changes and how they end up divorcing each other, how her mother gets cancer and how that breaks her heart, how after her divorce and after her mother has passed Cheryl’s life takes a turn for the worse – all these are depicted as flashbacks throughout the movie. Though there are many human characters and a few animal characters, I feel that most of the movie is about Cheryl’s conversation with nature – the desert and the mountains and the river and the snow and the forest and the trees – and what she learns from those interactions and how she evolves as a person because of that. Nature is probably the main character in the movie and exerts its profound presence throughout. Reese Witherspoon as Cheryl Strayed is wonderful. Laura Dern as her mother, who is always happy and singing and dancing, is wonderful too. She is a very inspiring character. My other favourite characters were the woman hiker with whom Cheryl has a conversation, and a young boy and his grandmother who come with a llama with whom Cheryl has a conversation. 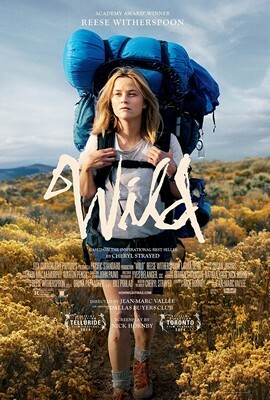 I loved ‘Wild’. It is a very inspiring movie. It is a shame that it didn’t make it into the ‘Best Picture’ nominations list. Cheryl Strayed says that it was snubbed because of Hollywood sexism. It is hard to disagree with her. Have you seen ‘Wild’ or read Cheryl Strayed’s memoir? What do you think about them? One of my book club mates saw ‘Boyhood’ when it came out and he has been raving about it since. So, I thought that I should watch it sometime. When I discovered that it was directed by Richard Linklater, I was quite excited. I fell in love with Linklater after watching ‘Before Sunrise’ and ‘Before Sunset’ and was wondering why he didn’t make more movies. Well, he has done that now. Now, about the movie. 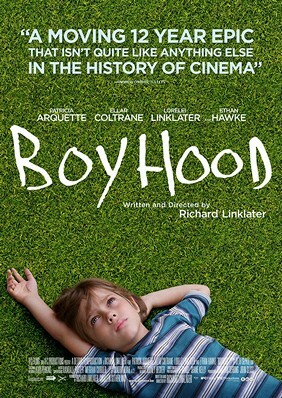 ‘Boyhood’ is, as the title implies, about the life of a boy who grows up to be a young man. Mason is six years old when the story starts and he lives with his sister Samantha and his mother Olivia. Olivia is a single mom. Mason’s dad visits them occasionally and takes them out for fun activities, but he is not really involved closely with their lives. Olivia gets involved with men who are nice in the beginning – one is her professor in college, another is a veteran of the Iraq / Afghanistan war – but in the end they all tend to be bullies who get drunk and treat her children not-so-well. The story closely follows Mason’s life – how he misses his friends every time the family has to shift because his mom breaks up with an abusive boyfriend / husband, how he gets used to a new school and makes new friends and sometimes has to confront bullies, his friendship with his mom’s new husband’s children, his interest in art and photography and the other transformative and messy things that happen in life like drinks and drugs and love, which is all part of growing up. Though we see the story mostly from Mason’s perspective, we also see a lot of Olivia, Mason’s mother – in the way she struggles to find love, how she has to work hard as a single mom and at the same time try to get a college degree and a job and find a career which fulfils her, the contrast between her relationships with her children’s father (which is mostly cordial) and with her current boyfriend / husband (which always spirals down after the initial excitement). Olivia’s life is a hard one but it is also rewarding and fulfilling and filled with love and kindness sometimes from unlikely places. Mason’s father, Mason Sr., is an interesting character. He has a good relationship with Mason’s mother and he is more a friend than a parent to Mason and his sister. He doesn’t play any part in the hardwork of day-to-day parenting, but when he makes an appearance in the children’s lives, he makes them happy and gives them good advice. Some of my favourite scenes were the ones in which Mason and his sister have long conversations with their dad, including one in which he gives ‘the talk’ and tells them about contraceptives. I also loved the scenes which depict Mason’s relationship with his girlfriend Sheena and how their relationship ebbs and flows across time. I loved most of the characters in the movie. Even the abusive ones were perfectly portrayed. The main characters who get the maximum screen-time – Mason, his sister and his mother – were, of course, all wonderful, but the other main characters who are sometimes the minor ones were also fascinating. My favourites were Mason’s dad and his girlfriend Sheena – the scenes in which they come were all wonderful. In the last scene of the movie, Mason joins college and goes on a trek with three of his new collegemates. Mason has a long conversation with one of them after they reach the mountains and that is one of the fascinating scenes in the movie. The movie on the whole is vintage Linklater, with each scene sculpted delicately, the story waltzing slowly and a lot of conversation happening on screen – conversation which we love listening to. Ellar Coltrane (Mason), Lorelei Linklater (Mason’s sister Samantha – how can one not like the name Lorelei :)) and Patricia Arquette (Mason’s mom Olivia) are all wonderful in their respective roles and Ethan Hawke teams up with his old friend Linklater and is brilliant in his role as Mason’s father. This is all about the story and about the performances of the leading players. The movie was wonderful, on these aspects alone. What amazes us even more is that the movie was made over a twelve-year period with the same set of actors and actresses. So we can see Mason getting older across the years (and Ellar Coltrane plays that role throughout) and so do Samantha and Olivia. I have seen this happen in TV series where the same set of actors and actresses work together for many years – for example the way Amber (Mae Whitman’s character) grows up from a wild brat to a responsible young woman in ‘Parenthood’ and how Jake (Angus T. Jones) grows up from a cute, smart talking boy to a handsome young man in ‘Two and a Half Men’ and of course how all the main characters grow up and evolve in ‘One Tree Hill’), but this is the first time I have seen this in a movie. Because it is next to impossible to make a movie across twelve years – so many things change across time – for example the actors / actresses may not be available, the story and the screenplay might get dated – but this didn’t faze Richard Linklater in taking this huge risk and making this movie across more than a decade. His effort shows in the final result, in the exquisite beauty and brilliance of the movie, as the story and the characters feel wonderfully realistic, like people from our own family whom we watch from up close as they evolve as people. So, what is my final verdict on ‘Boyhood’? It is a beautiful, remarkable work of cinematic art. Richard Linklater takes big risks with the way he tells the story and the main actors and actresses play their roles perfectly with realistic understated brilliance. ‘Boyhood’ has been nominated for both the ‘Best Picture’ and ‘Best Director’ Oscars and I hope it wins both of them. I haven’t seen most of the other movies which are competing in these categories, but I think Linklater’s movie is gong to be hard to beat. Highly recommended. I love Julianne Moore and so when I discovered that she has been nominated for the Best Actress Oscar for ‘Still Alice’, I had to see that. I saw it yesterday night. Here is what I think. ‘Still Alice’ is the story of Alice, who is fifty-years-old, is a brilliant professor of linguistics at Columbia University and has written the definitive book on the subject. She discovers one day while giving a lecture that she is not able to find the right word which will articulate her thoughts – the word slips from her memory and as hard as she tries to grasp it and hold it and get it back it slips away. When this starts happening frequently, she meets a doctor. The doctor does a battery of tests and confirms her worst fears – that she has early onset Alzheimer’s. Her husband initially refuses to believe it, but in the end accepts it reluctantly. Alice has three grown up children – two daughters and a son. The elder daughter is married and is trying to get pregnant. The son is doing well professionally, but his romantic life is a roller coaster. Her younger daughter has refused to go to college, lives in L.A. and is trying to become an actress. When Alice breaks the news to them, they are all shocked. Then the family tries to get together and help her in their own way. The situation slowly deteriorates and Alice starts forgetting more and more things. She is frustrated with the situation as she has always been an intellectual person who has lived a rich interior life. She doesn’t want to forget her favourite memories and she wants to be around as a normal person when her daughter has children and for other special family events. Before things cross the ‘no comebacks’ line, Alice makes a video addressed to herself. In that video she tells herself that when she can’t remember the answer to basic questions like ‘What is her eldest daughter’s name?’ and ‘When is her birthday?’ she should go to her room, take out a bottle of pills and have them all together with a big glass of water and go to sleep. They are, of course, sleeping pills. The rest of the movie shows how Alice’s memory keeps slipping away a little bit at a time and how her relationship with her family members evolves during that period. Does she see the video and take the pills? What happens to her in the end? You should watch the movie to find out. I loved ‘Still Alice’. Alice’s relationship with her family and how it evolves across time is beautifully depicted. The way Alice struggles with her condition, the frustrations and heartburn she goes through and how she learns to accept it – these are all beautifully depicted. I loved the scenes which had conversations between Alice and her actress daughter Lydia. Alice is frustrated that Lydia hasn’t gone to college and is taking high risks with her career and doesn’t have a ‘Plan B’. Alice wants Lydia to get a college degree so that it could help her if her acting career doesn’t take off, but her daughter is adamant about not going to college. She says that she doesn’t want a backup plan. Lydia resents the fact that her mother keeps meddling with her life and doesn’t accept her as she is. In one scene Alice says that she wants Lydia to have a good career and settle down in life before she leaves and Lydia says that Alice can’t use her condition to make Lydia do what she wants and that was unfair. Alice says that she can and that is because she is her mother. It is a beautiful scene in which we are able to see both the characters’ perspectives and we understand both sides and know that the issue is not going to be resolved anytime soon like all complex family problems. The way Alice progressively loses her memory is delicately and sensitively portrayed and it is heartbreaking to watch. Some of my favourite scenes from the movie were these – Alice’s conversations with Lydia on Lydia’s career, their discussion on a play Lydia is working on, and one of the last scenes when Lydia reads a play to Alice – I loved every scene in which Alice and Lydia come together; Alice weeping on her husband’s shoulder when she is frustrated by her condition and is not able to accept it; Alice giving an inspiring talk at the Alzheimer’s group – well there are many more, the whole movie was perfect. 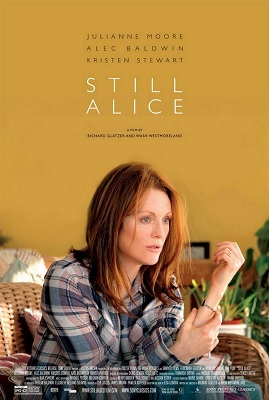 Julianne Moore as Alice is brilliant and has given probably the finest performance of her career. She has won every award out there for her role and I hope she caps it off with an Oscar on Sunday. The Academy has ignored her for so long and I hope they get it right this time. I also loved Kirsten Stewart as Alice’s daughter Lydia. Kirsten Stewart keeps getting better and better and has evolved into a fine actress. I hope she chooses weighty scripts like this and does more wonderful movies in the future. ‘Still Alice’ is one of my favourite movies. It is a sensitive portrayal of a woman who is slowly affected by Alzheimer’s. It is beautiful, inspiring and heartbreaking, all at the same time. I started watching it late at night and I hoped to see half of it then and half of it the next day. But once I started watching the movie, I couldn’t stop and though it went on till the wee hours of the morning I kept on going till I watched the last scene. After I finished watching, my mind was fresh, there was a spring in my step and my heart was more alive and was filled with happiness even though it was a untimely hour – this is the kind of effect that the best movies have on the viewer and ‘Still Alice’ is definitely one of the finest of them. If you haven’t already watched it, I would highly recommend that you do. Now a rant 🙂 I am surprised that ‘Still Alice’ has not been nominated for the ‘Best Picture’ Oscar. Not even for the ‘Best Director’ Oscar. I checked out all the movies which have been nominated for the ‘Best Actress Oscar’ and four out of five have not been nominated in either of these categories. Why is that? Why is the Academy ignoring movies which have a main woman protagonist for the ‘Best Picture’ and ‘Best Director’ nominations? Is this kind of thing still happening?? My movie watching has gone down quite a bit in the past two years after I started watching TV shows seriously. So, this week I thought I will do the Oscar thing-y – watch all the movies that have been shortlisted for the Oscars this year and write about them. I hope it will put my movie watching back on track. The first movie I watched was ‘American Sniper’. An odd choice for the first movie, given all the controversies that it has been surrounded by – including the fact that the Academy dumped Martin Luther King for a sniper character for the ‘Best Actor’ nomination (If you hate this movie for this or other reasons or if you want to hate this movie, you should read this article). But I love Clint Eastwood and so I thought I will give this a try. ‘American Sniper’ covers most of the same ground that was covered by ‘The Hurt Locker’, the only difference being that the main character in ‘The Hurt Locker’ defuses bombs while the main character in ‘American Sniper’ kills enemy combatants. But otherwise the locations, the camaraderie in the army, the bombs, the friends who get killed, the psychological trauma, the difficulty that a soldier has in adjusting to civilian life and how he yearns to go back to the warfront – these were all depicted in a way similar to how it was done in ‘The Hurt Locker’. So, in that sense, there was nothing new in this movie. Part of the story is about how our hero tries to hunt down an enemy sniper. The enemy sniper is nameless and he wears black and is just depicted as a bad guy. This was much better done in ‘Enemy at the Gates’ in which Ed Harris comes as a German sniper in the Second World War and he is a much better fleshed out and cool character. In fact the whole sniper thing was depicted way better in ‘Enemy at the Gates’. Most of the Iraqis in ‘American Sniper’ are shown as bad guys – even women and children don’t hesitate to pick up a grenade and throw it at the American army vehicles and sometimes they even take up a rocket launcher and fire it. It is a very simplistic and Hollywood-ish generalization and interpretation of a whole country and it makes one cringe. The scenes depicting the difficulty that Chris Kyle faces in adjusting to civilian life are also well trodden ground. Others have done it before and they have done it better. 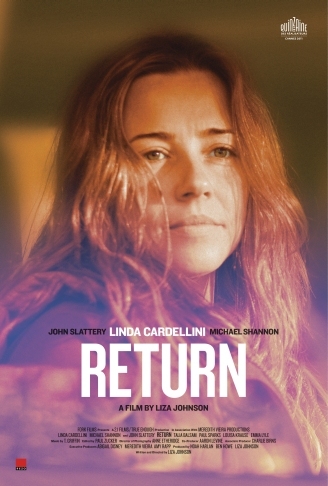 For example, the film ‘Return’ is about the life of a woman solider and it handles the ‘difficult-to-adjust’ part quite well. From a literary perspective, Erich Maria Remarque in his book ‘All Quiet on the Western Front’ has said everything that needs to be said on this topic. Others can only repeat. My favourite scene in the movie is the one in which Chris Kyle meets Taya at the bar and they have an interesting conversation and subsequently fall in love. It is an odd choice for a favourite scene in what is mostly a war movie but I am a fan of the quieter moments most of the time. 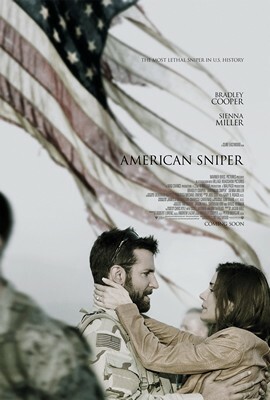 Bradley Cooper as Chris Kyle and Sienna Miller as Taya are perfect. Another of my favourite scenes is the one in which Taya calls Chris (who is in the warfront) after coming out of the hospital and tells him that their pregnant child is a boy. Chris is travelling with other soldiers when he gets the call and while he is happy with the news, there is shooting and then there is an explosion and he and his mates get their guns to return the fire and he drops his phone and Taya hears all the shouting and the screaming and the firing and the explosion and she doesn’t hear Chris’ voice and she doesn’t know whether he is alive or dead and she is in front of the hospital and she is pregnant and she doesn’t know what to do. So what is my verdict on ‘American Sniper’? I think it moves through mostly well trodden ground and so most of the story sounds repetitive and something which we have seen somewhere else and especially something which we have seen better articulated artistically elsewhere. The fascinating thing about the movie is that most of the events actually happened. But if we ignore that fact, I would say that it is an entertaining war movie, but probably not the finest example of its genre. I think it got really lucky to get into the Oscar nominees list. I wanted to write about something else here – something about which I have been thinking for a while, and something about which other movie fans I have talked to have been having similar thoughts. My straightforward comparison of ‘American Sniper’ wouldn’t be with other contemporary war movies but would be with the TV series ‘Homeland’. ‘Homeland’ treads most of the same ground but it is much better done – the plot is tight and gripping, the characters are more fleshed out, the scenes are intense, the dialogue is sparkling and there is style and class in the way it tells its story. One might disagree with the politics depicted in it, but it is hard to ignore it as a work of art. It is much better than any war movie that I have seen recently. Now the question that I wanted to ponder on was this – is the excellence of ‘Homeland’, when compared to recent war movies, because of the extra time it has to tell its story? (The first three seasons of ‘Homeland’ have one long plot and they come to a total of 36 hours.) Is that the difference between a good war movie and a not-so-good one – the time available to tell the story? Would ‘Apocalypse Now’ and ‘Saving Private Ryan’ and ‘The Deer Hunter’ been better movies if they had been longer? What do you think? I watched ‘Babette’s Feast’ today. It is directed by Gabriel Axel and is based on a short story by Isak Dinesen, who also wrote‘Out of Africa’. The story is about two Danish girls, Martine and Philippa, whose father is the local pastor. When young men show interest in these two girls, who are very beautiful, and ask for their hands in marriage, their father typically rejects them. The young women grow up and become old and continue their father’s good work. One day a younger woman arrives at their place. She is French and her name is Babette. She gives our heroines an introduction letter which is from an old French singer who courted Philippa when she was younger. The letter says that Babette had to leave France because her family was killed in the civil war. He requests the sisters to help her. The sisters take her in. Babette’s initially learns the chores from them and then is able to handle everything on her own, including the cooking. One day a letter arrives from France for Babette, which says that she has won ten thousand Francs in the lottery. The sisters think that Babette will go back to France. Babette says that she wants to organize a French style feast for the sisters and their friends and congregation to celebrate their father’s hundredth birthday. The sisters, after some initial reluctance, agree to the plan. Babette goes to France, gets her lottery winnings, and comes back with the ingredients required for the French feast. When the sisters see the ingredients – which include a live turtle, quail and French wine – they get uncomfortable. Martine has nightmares about it and feels that having a feast like this is sinful. The sisters gather together their friends and tell them that though they would all go to the feast, they won’t think or talk about the food and they will ignore the taste. The day of the feast arrives. An army general, who courted Martine, when he was a young officer, also comes to the feast with his mother. Everyone is apprehensive when the food is served. And then magic happens. The feast is divine. Each dish is a work of art – in colour, in appearance, in taste. The guests lose themselves in the sensual pleasures of food, which also brings them together as people and makes them remember their lives, their past, their loves. The feast magically transforms everyone’s hearts. After the feast all the guests go outside and hold their hands and dance in a circle while gazing at the beautiful twinkling stars. Martine and Philippa thank Babette for her wonderful feast. They then discover that she was a famous French cook. They also realize that she has spent all her lottery winnings on the feast to make them and their friends happy and also to practise her art to the best of her ability one last time. They also realize that she is not going to Paris but is going to stay with them. 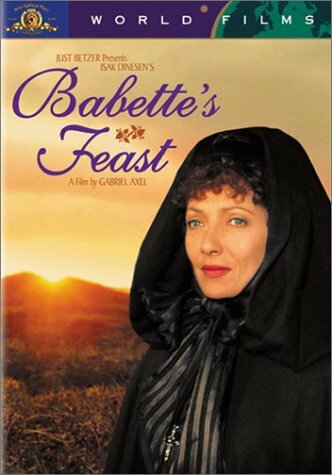 I loved ‘Babette’s Feast’. It is a celebration of food – almost spiritual in its intensity and vision. It is also a celebration of love and art and beauty. When Babette says towards the end – “I don’t cook. I practise art” – it gave me goose bumps. I wish I was there at Babette’s feast, taking a sip of the ‘Clos de Vougeot 1845’ and trying out Babette’s delicious works of art.